Hyaluronic acid injections are primarily used to treat knee pain caused by osteoarthritis. Hyaluronic acid (HA) is found in a substance that provides lubrication for our joints, synovial fluid. HA acts both as a lubricant, and as a shock absorber in the joints. This mechanism of action allows for the joints to function properly in individuals who have lower levels of HA, such as those with osteoarthritis. HA injections allow for pain and stiffness in the knees to ease, as the lubrication of the joints permits smoother functioning. HA injections are used in patients who have already been treated with steroids or painkillers such as acetaminophen and ibuprofen, but have failed to see adequate pain relief. HA is given in the form of an injection to the knee joint. The standard procedure for patients is to receive one injection a week for approximately three to five weeks, depending on the severity of osteoarthritis and response to treatment. However, HA injections do not work for everyone; treatment may be potentially ineffective if you are older or have more severe osteoarthritis. The advantages of HA injections are the mild side effects seen compared to other standard treatments for knee osteoarthritis. Some side effects seen are redness and swelling at the site of injection; these side effects are usually not bothersome. In comparison, pain killers such as ibuprofen and naproxen put individuals at risk of gastrointestinal bleeding, and steroids injections such as cortisone are harmful to joints if overused. Scientific research has shown that HA injections leave approximately 30% of individuals pain free after treatment, with symptom relief lasting anywhere from one to two years. 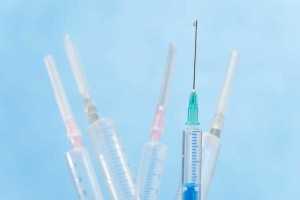 It has been found that HA injections work at par with pain killers in terms of pain relief, and produce greater results than painkillers for improvements in mobility. Continuous research into HA injections is completed by physicians and scientists around the world.